"In 1864 this village straddled the state line. The military road running north and south was ¼ mile west of the line. On October 23, 1864, General Sterling Price's wagon train moving southwest on this road turned south on the military road at 2 P.M. Followed by most of his army. Shelby's Division withdrew south at 3 P.M. with Union troops in pursuit. Jennison's and Ford's Brigades continued for four miles and stopped. Price continued south for 20 mies that night. Union troops camped near here and at Indian Creek." Directions to Stop 22: This marker is located on Santa Fe Road about 100 yards east of State Line Road. It's about 7.5 miles to the next tour stop. Follow 98th Terrace and Parkwood Avenue back to Bannister Road and turn right (east). Turn right to head south on US Highway 71. Take the exit for I-435 West and continue until the exit (75B) for State Line South. In about 2.1 miles, turn left (east) onto Santa Fe Road. There is a small church parking lot up ahead on the left (north) side of the street. Pull into the church parking lot and park next to the marker. This tour stop is located in Kansas City, Missouri 64145. 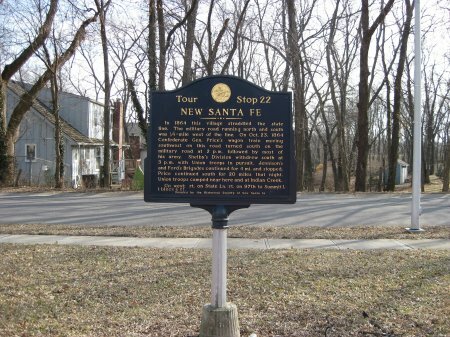 Description: New Santa Fe, also known as Little Santa Fe, was a popular stopping place along the Santa Fe Trail. It became an important link between Independence, Missouri and Santa Fe, New Mexico. In 1860, it had a population of 670. 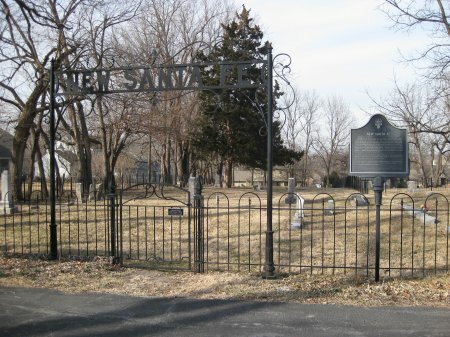 This was the destination for Price's wagon train because it provided ready access to he military road that ran From Fort Leavenworth, Kansas to Fort Scott, Kansas. Price's wagon train reached Little Santa Fe mid-day on Sunday, October 23, 1864. Because of the danger, the wagon train immediately headed south on the military road. The victorious Federals camped here on Sunday night while waiting for the Union commanders to formulate their plan for pursuing the retreating Confederates.